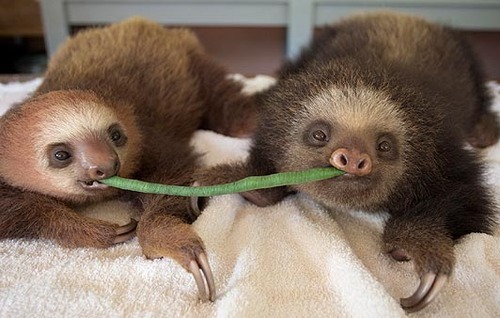 Sloths love both community and Oscar Wilde references. I’ve talked before about my literary citizenship class with Cathy Day, where we learn about why, as writers, we should be making an effort to be part of the literary community and how we can do that. For the class, we all had to participate in organizing a literary event. I was in a group of five (click for their blogs) that helped to promote Ball State’s 8th In Print Festival of First Books. If you happen to be in the Muncie area, In Print continues tonight with a panel on publishing and writing. Student Center Ballroom, 7:30 PM, be there or be square. I have to give a quick plug for the attending authors – Elena Passarello, Marcus Wicker, and Eugene Cross – because they blow me away with their writing. They reminded me just how badly I want to be a writer. I dream of being able to manipulate words and shape stories – in fiction, nonfiction, and poetry – the way they do. Go read them. Part of this assignment was to blog about the experience of organizing a literary event. I’ve spent weeks trying to figure out how to do that with promoting In Print. What do I talk about? Brainstorming places to advertise? Writing the article for the Muncie Voice? Blowing up Facebook and Twitter? What would be the point of that post? I didn’t want it to read like a homework assignment. She just wanted the information because our professor was giving out extra credit for attendance. She had no idea what she’d done for me. At that moment, I finally felt connected to the festival. I was a person to go to for information – a trusted source. Compared to the huge amount of work that went into putting In Print together, I did very little, but suddenly it felt like it was mine. I was proud. My part in this amazing event may have been minuscule, but I was still part of it. It was on the inside of the literary community and it felt so right. If you’re a writer or a reader, go get involved. Volunteer and spread the word. If you can’t find an event to be part of, go make one. Help your fellow writers. Be a literary citizen. You won’t regret it. What I’m always intrigued to know is: HOW THE HECK DO WE GET PEOPLE TO COME THESE EVENTS THAT WE PLAN? WHY WOULDN’T A CREATIVE WRITING MAJOR COME? WHY WOULDN’T PEOPLE IN MUNCIE COME? You guys are used to events being provided FOR you. It’s an entirely different thing to be a part in planning them and then finding a freaking audience for them. That’s what we always want to know about how to do better. I’ve been thinking about my reasons for not going to events like this in the past. I always had a reason not to go. It was a bad day, or I was worried that it would be boring or awkward, or I didn’t have someone to go with. I always had excuses. I’m glad that going to In Print was required, because it made me go, and I loved it so much that now I’m convinced that all of those excuses need to be put away and if it’s at all possible for me to go to a reading or a panel that’s up my alley, I should. I can feel it like an addiction. I want to meet writers and be around them and learn about books I never would have heard about before. Which doesn’t solve the puzzle of how we get people to come to them in the first place.